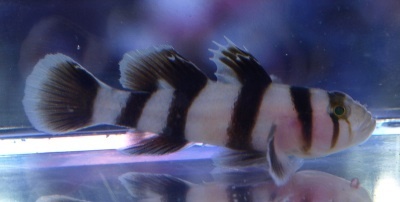 The Black Barred Circus Goby has other names like the convict goby, white tiger goby, circus goby and Priolepis nocturnus, its official scientific name. Their name comes from the brown or black vertical stripes on the fish’s body. The rest of the body is white or light gray. This member of the Gobiidae family is native to East Asian waters on the Indo-Pacific Ocean coast. This is a medium sized goby; most black barred circus goby fish are one to one and a half inches long, though some reach two inches. This fish is a carnivore. However, it is generally peaceful and reef compatible. The fish eats mysis shrimp and brine shrimp but will leave snails, clams, reef polyps and crustaceans alone. They can also be fed chopped clam or meat based reef fish foods. The shrimp should occasionally be soaked in vitamins before being fed to the goby. In the wild, they eat benthic copepods. Some people report successfully feeding the circus goby Cyclopeeze. They spend most of their time slowly swimming through the tank or perching on live rock. They do best in habitats with lots of hiding places. It will spend much of its time swimming among the rocks except to dart out to get food. Do not put the Black Barred Circus Goby in a fish tank with frogs and anglers. Use caution putting them in tanks with large angel fish and tangs. Don’t place them in tanks with dragonets, sharks, wrasse, squirrel fish or rays. In general, this fish is fine with other fish, since it won’t eat fish smaller than it, but it shouldn’t share a tank with a carnivore large enough to eat it. Two or more of the same species can only share a tank if it is a large one. This fish needs a tank with at least 20 gallons of capacity. They need water temperatures of 72 to 78 F. The water hardness should be between 8 and 12 dKH. The water specific gravity should be between 1.020 and 1.025. This goby fish is considered suitable for beginners.